Note that all stages, except 4, appear in both male in female forms. Shown genders only for illustration purposes. They get progressively larger; Stage 1 would be 6 to 7 ft, Stage 2 8 to 9, Stage 3 9 to 11 ft, and Stage 4… huge. While the demon lords, Odontaspis included, are clearly not gods, but they also most certainly aren’t mortals. They don’t rely on worshippers for their power (as gods in that universe would), and they aren’t terribly efficient at “harvesting” the power from worshippers, but they do have them. The worshippers do present some power directly to the demons they follow, but more important is the services they perform. They conduct sacrifices, summon the demons forth when they need to take direct actions in the mortal realm, and so forth. Serving a powerful demon so closely doesn’t come without a “price,” though. In the universe of Odon and Gil, the mortals are all basically human in shape, but as they begin to worship demons, their bodies become corrupt with the backlash from the demon’s form. Of course, to one so immersed in demon worship that these changes begin to happen, such corruption is no curse, but rather a gift. Odontaspis, in particular, makes specific demands of his “priests.” He’s a serpent, and I follow some of the traditional serpentine demon aspects. While he’s certainly a creature of destruction (and, let’s be honest, voraciousness, enjoying the act of eating people), he’s also one of temptation, corruption, and seduction. It is this nature he encourages in his priests, especially the lower ones. As such, he largely forbids his priests clothing except when unavoidable. As a cold-blooded creature, he tends to be worshipped most commonly in tropical regions, making it all the more likely that little clothing is socially acceptable, as well. In the first stage, they still maintain close contact with the general population, attempting to recruit more potential worshippers, through whatever means possible, which often means outright seduction of others. The fact that they have a long, snake-like tail, red eyes, and the beginnings of scales over their bodies certainly doesn’t make this easy for them to attract most people, but it does do one thing: Those who would be attracted to them also are more likely to accept the serpent demon as theirs. The second stage adds something else to their nature: death. 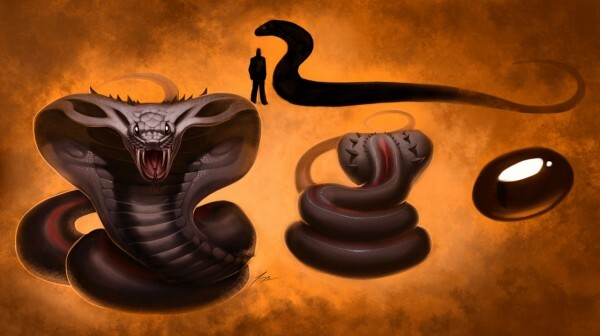 With the large snake-like head, they become killers as much as seducers. While Stage 1 have fangs, certainly, they are mainly for defense and not as effective as the ones in the giant snake-heads of Stage 2. They become entirely carnivorous, typically eating small mammals, swallowing them whole, just like a snake. They aren’t nearly big enough to eat a grown human (only being slightly taller than a normal human), though there may be some worlds in which they personally take small children as sacrifices, as unpleasant as this may seem. That being said, they are still expected to participate in the seduction side of things, though it DOES become more difficult for them. By the third stage, they have turned entirely from seducers to killers. There aren’t many of these forms, at most a handful, and then only on worlds infested with worshippers of Odon. They rule the worshippers, and are dealmakers, negotiators, and, if a deal is broken, enforcers. While it’s not intended as their main diet, the largest of them may even be able to feed upon the humans around them. Stage four, clearly, is when a worshipper has entirely given themselves to the demon, no humanity left. They are still, technically, mortal, though just barely. There would be, at most, 4 or 5 of these in the entire universe, Odontaspis moving them from world to world as they are needed. They (unsurprisingly) feed on the population around them, voraciously in fact. Unlike the other forms, these are exclusively female, and often serve as the demon’s companions when traveling in the mortal realms.